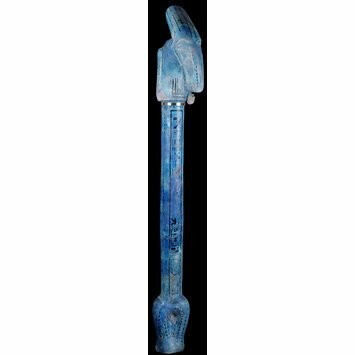 Monumental Uas (ritual sceptre or staff) in blue-green turquoise-glazed composition or faience. The sceptre bears the head of the animal of the God Seth, and originally had two armsat acute angles (now broken off at the elbows), which may have held a standard or been raised in adoration. The sceptre terminates in a pair of vestigial legs. The body of the sceptre is painted in black with vertical bands, pear-shaped dots and diaper ornament on the arms, and a central vertical inscription bearing the full titulary of Amenhotep II Two further cartouches also bear his name. Aa.kheperu.ra, Amenhetep (Cartouche I). Neter.heq.uast (Cartouche II). Horus, Strong Bull, Possessor of Might, Heir of the Two Ladies i.e. the patron goddesses of the north and south, crowned in Thebes…King of the North and South, Ankheperura Son of the Sun, Amenhotep, Divine Ruler of Thebes, May he live like Ra for ever! (central vertical inscription). Prof. W.M. Flinders Petrie DCL found the Uas in multiple fragments in 1894, during excavations of he temple of the god Seth, Lord of Nubt, in Naqada region (Greek: Ombos; modern name: Tukh) opposite Koptos (Quft), Upper Egypt. This temple was built by Thutmose I (Greek:Tuthmosis I). H. Martyn Kennard, who presented the Uas to the Museum, was Petrie's financial backer at the time. Amenhotep II was renowned as a good horseman and fast rower. The first nine years of his reign were spent in military campaigns asserting Egyptian power over revolts in vassal states. Peace and prosperity attended the remainder of his reign in which he occupied himself with temple building. The Uas was an item of temple equipment. It was a kind of sceptre usually shown placed in the hands of gods as a symbol of their might. The hieroglyphic sign which looks like this sceptre equates to the Egyptian word w3s meaning 'power'. The object and sign also occur as an iconographic emblem and as an amulet of power that could be worn. In certain contexts, usually in relief, but also here, the staff itself has hands and arms. The huge sceptre is the largest known example of ancient Egyptian faience. Composed of powdered quartz rather than clay, faience was moulded or modelled by hand. It was the first material to have a glaze, here coloured turquoise by the addition of copper. The sceptre, a symbol of divine power, was found in fragments in a temple. Its animal head probably represents the god Seth. Composition with alkaline glaze (faience).